it was a Sunny day at the pride lands. and the animals of the kingdom gathered towards Pride Rock, because there was a ceremony. King Simba had a second child, a son this time. Princess Kiara and Kovu were there, too. Vitani was with Nala, to help with her newborn son. And Rafiki was explaining to Nala how the ceremony would go, since it wasn't the presentation of a heir to the throne. It was a different presentation, but also very festive. When the animals of the Kingdom of Simba were gathered around Pride Rock, Simba spoke. "I will present you my new son. His name is Kion. He will protect the pride lands, and will stand by his sister Kiara to advice her when she becomes our future queen"
A rhinoceros asked "Where is he, your son Kion?" "he will come now" Rafiki answered, with a little bundle in his hands. "I present to you, the second son of Simba and Nala, brother of Kiara: prince Kion!" There were monkeys, giraffes, zebras and birds too. The ostriches cheered "hooray for Kion!" And all the other animals did the same. "welcome to our lands, little prince Kion"
Kovu and Kiara stepped on Pride Rock to watch over the lands and all the animals. Vitani also did the same thing and finally Nala, the queen, arrived and the animals shouted louder than ever. It was very festive, and a few weeks later, Kion was a little bigger than that day. Kiara took him for a walk, together with Kovu and Vitani. "this is were I did my first hunt" Kiara told little Kion. "wow, that must be very exciting" Kion answered. "that is not a very friendly thing to say" Vitani giggled back. Kion laughed. "You guys are very funny"
Kiara mumbled. "Every great hunter starts at the bottom. I needed some time"
Kion got interested more and more. "can you show me how you hunt right now?" "Yes, Vitani tought me a lot, she was a born talented huntress. Vitani and I are a great team." Kiara explained to her little brother Kion. "Sure, Kion, we can catch some treat for you" Vitani nodded. "you may watch, but do not move or make noise. That will scare the prey away"
"I will watch Kion. Good luck" Kovu answered. Kovu and Kion hid behind a rock, that was just big enough to watch pass through. So that they could see how Vitani and Kiara hunt. "shh, no noise!" Kovu shushed. And then the lionesses spotted a prey. It was a small hippo. They started to crawl low in the grass. They got really close to the little hippo. But when they were almost very close, Kion shouted. "no! don't harm him. that is a friend of mine!" I really hope you liked the first chapter. I do not know if I am talented, but it was fun to write this and I hope you enjoyed reading it. Here is chapter 2. It is a short chapter. But i can not help it. That i am busy. I type on my cell phone which is not very easy with the small letters. What is it. Kovu looked to kion. Well that is beshte. He is my friend. He is part of the lion guard. the lion what? Kovu asks. Oh i know about that. Kiara answers. She explained to kovu about kion. And that this hippo and his friends protect the pridelands. that is in fact a very good thing to do. Kovu tells kion. You are a gentle prince. And therefore i will let your friend beshte go. Kion sighted in relief. Thanks. Beshte says and walks off. What shall we do next? Vitani asks. Well we can play tag, kiara giggles. Yeah i want to do that, kion says. Vitani and kovu run off. Okay catch us if you can!! Kion is not as fast and remains with kiara. Come on kiara we can play tag together. But do not run so fast or i will really get tired. Kiara laughters. Yeah i am your sister so i will be good for you. Vitani and kovu are teenagers. They will grow up later. Kion bursts into fun and they walk off. The sun sets and another great day comes to an happy end. The next day Kion woke up and looked around him. His parents Simba and Nala were asleep, and Kiara was outside with Kovu. Vitani was out hunting. When Kion wakes up, he Always is very awake, and wants to play on the instant. But his family is adulted and teenagers, so he is the youngest. Kion asks Kiara: "do you want to play outside with me?" Kiara says "no" and walks off. Mom, dad, will you play outside with me? "No" Simba says. "I have royal duties, I have to speak to the Mountain Queen, she is the leader of a lion pride just across the Prideland Borders"
"no, it is dangerous, it is a long walk. You would get exhausted. You better stay safe here, at pride rock"
"but I want to come with you" Kion protestes. "I sayed NO!" Simba angrily screams. "well then I have to be bored all day, since nobody playing with me!" Kion shouts back at his father. 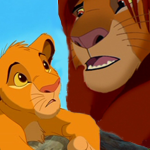 "Shush, Kion, don't be brutal on your father. He is a king, and you must therefore respect him" Nala says. Kion walks off angrily, and then he decides a decision. "I know what I am going to do!" he tells himself. "I will follow my father, without him seeing me! It will be a great adventure to tell to my friends of the lion guard!" Kion decides to pick his female friend Fuli the cheetah up for this one. She is mischievous and in for this kinds of trips. "Fuli, are you there?" Kion yells when he got at Fuli's family place. It is a tree with a hole under it. "coming!" he hears as an answer. Fuli appears and they run off together. "Listen, Fuli, My dad will leave about any minute. He leaves from the back of the lioness cave of pride rock. We wait a little, then follow him." "that is a great idea Kion! I am totally excited." Fuli starts jumping around. "ouch, we don't want that, don't we!?" Fuli replies. After five minutes of waiting, Kion and Fuli see Simba leaving pride rock. "bye Simba, be carefull!" Nala screams back. Kion and Fuli follow Simba. The area around Pride Rock is an easy place to sneakily follow Simba, the grass is tall and there are plenty of rocks to hide before. Then they cross the river. They wait because Simba would otherwise see he is beeing followed. "now!" Kion wisperers to Fuli. They walk over a tree log, that is over the river. "watch out for crocodiles, they live here!" Kion warns Fuli. "okay" Fuli looks around herself in the water but she does not spot any crocodiles. They get to the other side of the river in safety and they have to run, because Simba is older and faster than they are. After a long walk, they reach the borders of the Pride Lands. Simba roars. "why does he do that? " Fuli asks to Kion. "to scare away the hyenas that live close to the borders" Kion answers. "dad told me they are scared of him. We must be carefull now. If the hyenas spot us, we are in big trouble!" Fuli sighs. "that is a scary thing"
"Yes it sure is. Hyenas are very mean and mercyless" Kion says. I wouldn't be surprised if the pilot plays somewhat like this though I don't think Nala would bring up the fact that Simba was a king to her son she would probably just say respect your father. Also it's a little too straight forward to the point. What kind of tone do the characters say their lines in what emotions are they thinking what motivates their actions stating these little details can make all the difference don't get me wrong i won't be surprised if it is a lot like this but I also thought i'd give you some constructive criticism after all we can't grow and improve and we don't know what our flaws are this applies to writing too either way keep writing but take what i said into consideration see you around. a few months later Kion met with Fuli, Beshte and Ono and Bunga. hello there everybody, Kion says to greet his friends. how is everybody doing today? Fuli asks in return. so much questions, lets just have fun, Besthe screams. They run off to the water hole, where all the younger animals meet when it is a Sunny day. today, we celebrate that the sun is shining and that we are the best friends. that is a good thing to celebrate, Bunga says. You guys are indeed my best friends and what do friends do? Have fun, off course! Fuli shrieks. Lots of fun! lets take a dive in the water hole! that sounds like a good idea, I love beeing in the water, Besthe grins. I am a hippo, get it? beeing in the water? Yes, Besthe, we understand you joke, Ono nods. Now lets swim and have some fun. They spend the whole afternoon in and around the waterhole, even splashing around with the zebras, and chasing away a few snakes in the grass. Now lets go home, we meet tomorrow... then we have a duty to work on. Kion says. The other four get excited. Well, what is it then? a surprise...Kion whisperers. An adventurous surprise! aw, come on Kion, just tell us a slip of the tongue! Fuli begs for more information about the matter. "nope, just wait and see!" Kion runs off. "well, see ya tomorrow" Bunga laughters. "you know more of this, dont you?" Fuli stops Bunga. "can't tell" Bunga pushes Fuli aside and runs off as well. Fuli sightenens. Argh, you boys! I can't deal with surprises. just wanna know what is coming!" Me too, Ono shatters. Me too. But I gotta go. Tomorrow we will meet. And I hope this adventurous idea of Kion is great"
"bet he will have a great idea!" Besthe waves goodbye with his small tail. "gotta go buddies!" And another day was at his end at the pride lands water hole. the next day they met. all were excited. Kion and Fuli went together to pick up Bunga, Besthe and Ono. Ono was a bit in a panic. What is it, Ono? Why are you so tense? Fuli asks. I am tense because of yesterday and you told it was a surprise. I like to know what is coming. Is it dangerous what we are going to do? "no, it is not dangerous" Kion answers. But it is exciting. that is a different thing. oh, then I guess it is okay, Ono sightenens. Fuli laughters. That is so funny Ono, you are panicking so fast and easily! Now shut it, both of you! Besthe roars like an adult hippo. It is not nice to say that someone is a scaredy cat. I didn't say that, Fuli snickers. "guys, please. come with me and stop bugging each other" Kion asks. ok we come. the other four answer. and they make up and be friends. what is with them then? are they in trouble? no but the baby monkeys can not climb very good and we are going to learn them. we are monkey teachers for a day! Yes I am a good teacher in Climbing Besthe nods. they all laughter out a loud voice. and then they reach the monkey tree. hello monkeys show yourselves to the Lion Guard! and there the monkeys appear. hello you all, welcome to the monkey tree. this is the tree where the monkeys live. all our families. HI kila, I am Kion. and this are my friends bunga besthe ono fuli. and we teach you so you are going to be just as good as us in Climbing. so... a hippo teaching me to climb? Kila laughters. or a bird? you fly, you don't "climb" Kila snickerers. stop that you brutal mouthed little monkey! Fuli is sick of it all. if you are not greatfull for our help, then we will leave. if you want a lesson then we stay. ok sorry Kila answers. please stay. i didnt say i didnt like you. it is just that you are a funny group together. yep, but also a very brave, friendly and smart group, Bunga tells Kila. the lesson start. and at the end of the day all monkeys climb like bosses. the end of the day they all go home. Bye Kion, bunga says. Bunga lives with timon and pumbaa. they are a happy little family. timon and pumbaa take care of orphaned animals from the pride lands so there is Always a lot. kion goes back to simba nala and Kiara and besthe goes to the waterhole with his parents and aunts and uncles and nephews. and Fuli? she lives on her own in a tree. Ono lives in a group of egrets and the leader of them. he does a great job. the next day Kion went to the water hole to pick up Beshte and Ono, who sat next to him next to the water. "we did a great job with the monkey Climbing lesson yesterday, didn't we kion?" Ono says. yes, and today we are going to be help full again! Kion shouts happily. what is it then, Besthe asks. Pick up Fuli and Bunga, and we find out! Kion runs off, and the other two pick up the rest. Kion says we meet at the back of pride rock, friends! Ono says. Okay, lets go then, Fuli and Bunga answer. They run and fly off to a brand new adventure. They arrive at pride rock, at the back. We are so excited! What are we going to do today? Well....Kion says...we have to help here, at my place. Dad gave me chores. I have to clean out the den. NO! that is not fun, I will return to my living space, Fuli smuggers. Well then I do it alone, and there will be no adventure later today. They decide to do the chores. actually it is fun because they sing and dance doing them. And Kiara also helps them because she loves her little brother and his friends. Okay, we are finished now. Kion thanks every member of the lion guard for their help. and Kiara who did some help too. Then they run off for a new adventure. Thanks! so well that is been a quite long of time, but now I did return to finish this fanfic. but I will start it over again. so this is a new story. It was the begin of a new day and the sun rose against the walls of Pride Rock to the air. The animals in the kingdom awakened and the lions of the Pride Rock did awaken as well and jawned. So lazy, Kion stretched himself towards the outside of the cave where they sleeping. Now Kion was in the outside and into the sun. "wow!" Kion rose above, to the top of Pride Rock where he watched all over the Kingdom. "good morning brother!" Kiara was awaken and now joined Kion in his sitting on top of the rock as well. "let's get conjoined, to the waterhole!" Kiara purposed and Kion accepted the request and followed the future queen. Arriving at the waterhole, Kion concluded that his friends of the Lion Guard became arrived, he greeted them with a signature wave. "hi there Kion" "hey Kiara" everybody did the greeting and then the playing around became a reality for all of them. The fun immediately stopped when Janja arrived. "out of the Pridelands hyena!" Kiara runned to Janja to chase him out of it. "back in the Outlands Janja!" Kion roared and Janja flew off out of the Pridelands. "wow, that was the close call" Bunga did a sighting. "phew well now it is over lets have play fun and good times" All of the friends conjoined into the water hole and sang about swimming and splashing each other with water. The only ones unliking were the fish. dawn. the sun rises and the guard assemblies at the very top of pride rock. the sun fades in and kion speaks the duties of the new day through. bunga is easily occupied with ant patrol. dissapointed he fades out of the rock. "i am the bravest. do not forget!" Kion tells Ono to flee with Beshte to strip the lands off hyena ground. Janja was seen near the borders of the Pridelands once and again. Fuli and Kion remain. they strut the waterhole to see if they can lend a paw. but there are only a few animals there at the watering hole; 2 elephants, female. 1 zebra, male. A leopard cub and his mother. 3 female ostriches. everything is going well. "lets take off early and join bunga on the ant patrol" Fuli suggestes. they go to Bunga and find him....asleep! "Bunga! hey! how did the went..the ants." Kion roars in full disgrace while Fuli shakes in wild unintention. "i ate them!" Bunga answers. "what!!!" Bunga says its a joke. the fuzzy laughtater. it was a nice morning and the lion guard assembles. lets save some prideland animals kion porposed. fuli agrees and speeds around the swimming hole. she spots a lion. behind a tree. kion come watch!! there...is saw a brown lion cub behind the tree near the swimming water. come take a look. bunga kion ono beshte and fuli in the front race toward the mischief. show you self! strange cub! kion screams in order of the hiding brown furbowl. then all of the sudden the cub shows him self. hello i am kovu from the outlands. who are you? we are the lion guard. this is kion, fuli says. he is the son of king simba. kovu ansers: i do not like simba. he killed my father in law..king scar. yes he was the husband of my mother. simba murdered him. nono..ono says. simba avenges his dad mufasa. he had no choise. ok kovu answers. lets play! they all went swimming. beshte in particular he is great with water he is a hippo.